“He makes me so angry”. “She’s the reason I drink”. “My parents made me feel worthless”. “Our son is 24 and he still lives with us. I hate it.” Blame. It’s very popular. If we knew how much power there is in letting go of blame, we could quickly transform our lives. I know. I’ve spent a lot of years in the past blaming — my dad’s rage, my lousy marriage, religious guilt, dating after divorce, adult children struggling… yikes. I think I was the most judging in my 20s, confused in my 30s, liberated in my 40s, and happiest in my 50s. The happy part comes with accepting how messed up (and lovable) most people are. As a therapist, I have been listening to clients for 15 years. Lots of blame. The story is usually that someone else should be kinder, wiser, more timely, more laid back, more organized, more patient, smarter, more attractive, more articulate, more fair, more thoughtful. Rarely do we consider that it may be a victory for our insecure dad to be merely yelling instead of throwing a lamp through the window. Even more damaging, is all the blame we put on ourselves. Then comes the less conscious self loathing. Here’s the core of the problem: there is no power toward change in blaming. Yes, we have been hurt by others. But if we convince ourselves that we are permanently damaged by what happened, we begin to believe we are worthless. If we are in love with being a victim, we are seeking rewards by being small, and thrive on pity. We get people to take care of us, we lose sight of our ability to change our situation. We are more drawn to being resentful than being grateful. We convince ourselves that we are what happened to us. But the truth is, we are what we have chosen to believe. We were all raised by wounded humans that were doing the best they could given their own insecurities and secret traumas. Serenity doesn’t depend on events outside of us, but it does depend on the meaning we place on events, the story we write in our heads. On November 15, I’ll be presenting on this topic to a group of mental health professionals in Minneapolis. The continuing education workshop is entitled, “I’m Miserable Because of You”: Undoing the Blame Game (see Workshops & Retreats). The goal of this seminar is to provide inspiration, skills and techniques to instill profound change in clients by moving them out of resentment, blame and victim mentality to empowerment and personal responsibility. Too often, we as therapists unknowingly impair our clients by focusing on all the ways they have been hurt or betrayed by life circumstances. We need skills to show empathy without enabling people to stay stuck in self-pity thereby encouraging their role as a victim. As therapists, we hear from our clients all the ways their parents, partners, ex-spouses, bosses, children, jobs, siblings, coworkers, friends, the economy, the government — have hurt or disappointed them. Authentic change requires acceptance that life is difficult and the ability to find the tenacity, hope and wisdom to move forward in spite of, or even because of, the things we have endured. Being consumed with anger and resentment results in depression, anxiety, poor health and strained relationships. Alcohol, drugs and other addictive behaviors are used to cope with resentments and fear. Additionally, many therapists were first drawn to the field to work through their own personal pain, resentments and victimization. 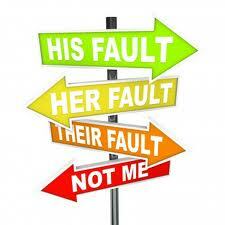 Becoming aware of our own unconscious blame is necessary to help free clients of the same. Here’s to accepting the imperfection in ourselves and thereby showing compassion to others’ faults. Life is difficult. Get going on your mighty purpose. ← Embrace your dark side — Happy Halloween!